At Arundel Arboretum we have a beautiful and extensive range of evergreen trees as well as evergreen shrubs. Not only do they bring all year-round colour but we have plenty in stock too. They are great plants to use for privacy or even screenage. 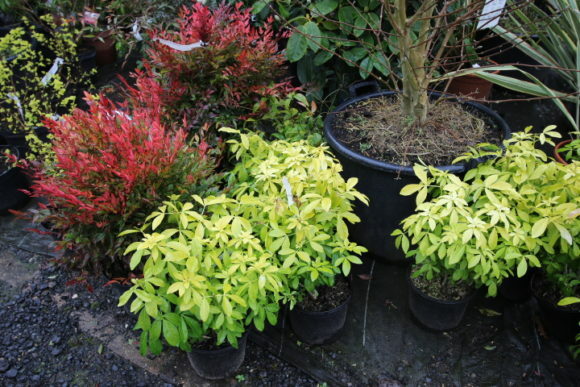 We can advise you on the most suitable evergreen tree or shrub for your garden and garden needs, we always consider where you are situated and how this can affect the plant as well as what your budget is. Of course, it does come down to what you are trying to achieve too, whether you are trying to block something out or possibly softens and aspect in your garden. Our extensive range of the evergreen trees and shrubs cover plants that grow fast (Leylandii) and plants that are tolerant of salt conditions (Griselinia Littoralis) – great for homes by the sea. Photinia x fraseri ‘Red Robin’ tends to be a popular choice due to it being beautiful during springtime. Arundel Arboretum offers a selection of plants, either as bushes or as half standards and full standards. The benefit being, of half standards and full standards, is the ability to plant smaller shrubs underneath. Ligustrum japonicum lucidum ‘Excelsum Superbum’ is an evergreen tree. 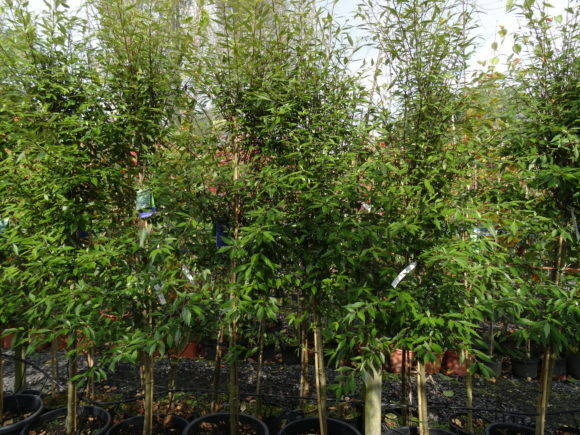 This is popular when being used as a screening tree due to it bringing in a good amount of light into your garden rather than just blocking it out. The plant has ovate leaves that are tinged light green with creamy-yellow edges. Ligustrum japonicum lucidum ‘Excelsum Superbum’ produces beautiful cream coloured flowers in late summer. These are followed by black fruits in the autumn (although please note not for human consumption). The tree will grow perfectly in shade\semi-shade. It is a hardy evergreen, but may drop its foliage if the temperature falls below -10. A popular choice is Hoheria sexstylosa ‘Snow White’. This evergreen tree has a pyramidal shape. It produces large amounts of wonderful white flowers in June\July. It has a height of 5m (eventually). It can be pruned to a size in keeping with its surroundings. Hoheria sexstylosa ‘Snow White’ is classed as reasonably hardy and should be able to withstand temperatures between -5 to -10. However, if it’s on an exposed site or in severe weather conditions, it can be damaged. We do recommend providing some shelter in cold areas. Choisya ternata ‘Sundance’ is a striking form of Choisya ternata. It is a medium-sized evergreen shrub with a rounded habit. The attractive bright young yellow foliage is aromatic when crushed. It produces small clusters of fragrant white flowers. Choisya ternata ‘Sundance’ can be planted in full sun in a sheltered position. It has an eventual height and spread of between 1.5m and 2.5m and should be planted in a moist, well-drained soil. 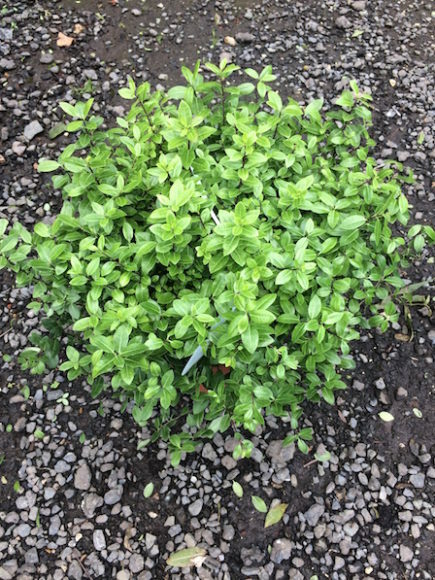 Pittosporum tenuifolium ‘Golf Ball’ is a compact evergreen shrub, with small light green oval shaped leaves. It produces pretty tiny purplish-black flowers in spring. It has a moderate growth rate, but please note this is usually slower if it is planted in a shady position. Pittosporum tenuifolium ‘Golf Ball’ has a rounded growth habit, and it does respond well to trimming. It is therefore ideal to use as a hedge or keep as a specimen shaped architectural shrub. It has an overall height of 1m eventually. At Arundel Arboretum, we have a great selection of evergreen trees and shrubs suitable for all conditions, where your home is or weather conditions too. Feel free to pop in and see our extensive range. As always, our informative and friendly staff will be happy to advise and assist you in selecting the perfect plants for your garden.